Here it is...the June 2009 edition of Daily Inspirations...download it now for FREE here and start scrapping!! Entries are due by the 5th of the following month. June entries are due July 5th. 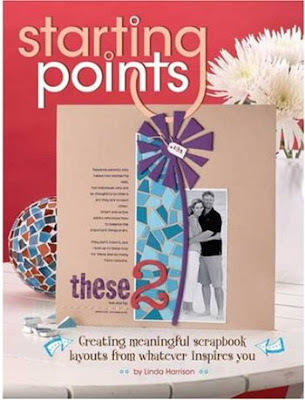 This month's winner will win a free copy of Linda Harrison's great scrapbooking idea book, Starting Points: Creating Meaningful Scrapbook Layouts From Whatever Inspires You. 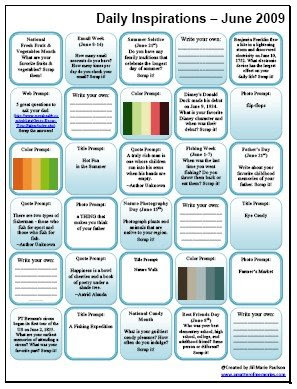 Download the FREE JUNE 2009 DAILY INSPIRATIONS now and start scrapping!! It's not too late for your chance to be inspired and win the May 2009 Daily Inspirations prize! Layouts can be submitted until Friday, June 5th, 11:59 PM (CST) for a chance to win the complete Dutch Girl Paper Crafting Kit by Cosmo Cricket!